Imagine never having to manually clean your car again, or taking it to a car wash for that matter. Ford will make this, and more possible with their latest invention. A recently published patent from Ford reveals a vehicle cleaning drone invented by Ford Engineers. The cleaning drone is designed to automatically clean specific parts of the car upon receiving cleaning instructions from a user through a smartphone. The cleaning drone includes sensors like cameras and ultrasonic sensors allowing the drone to automatically detect objects that the drone is instructed to clean. Further, clamp arms are connected to the chassis (the main body) of the drone. The clamp arms can be connected to clamps such as cleaning clamps, drying clamps, and rinsing clamps. The cleaning clamps include brushes, and drying clamps include fans blowing air heated by a heating element. These clamps do the actual dirty work of cleaning. Further, the drone includes washing and rinsing tanks full of clean water and liquid detergent. The tanks are connected to sprayers to spray water and liquid detergent when required. Upon receiving cleaning instructions from a user (through a smartphone, a computer, or a dedicated remote), the drone flies, detects the object to be cleaned (like a RADAR or LIDAR sensor) and attaches to the object with the clamps. The drone then proceeds to clean the object. 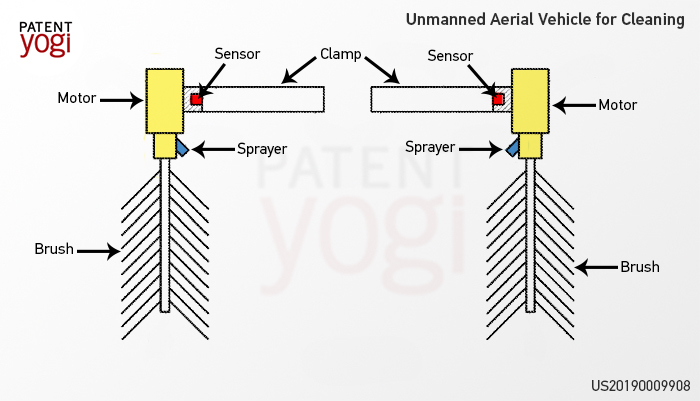 As previously revealed by Patent Yogi, Ford also plans to sell cars with companion drones. These companion drones are designed to help in navigation, landmark identification, and even troubleshooting. It seems that Ford wants to increase the capability of these companion drones by providing them cleaning capability. 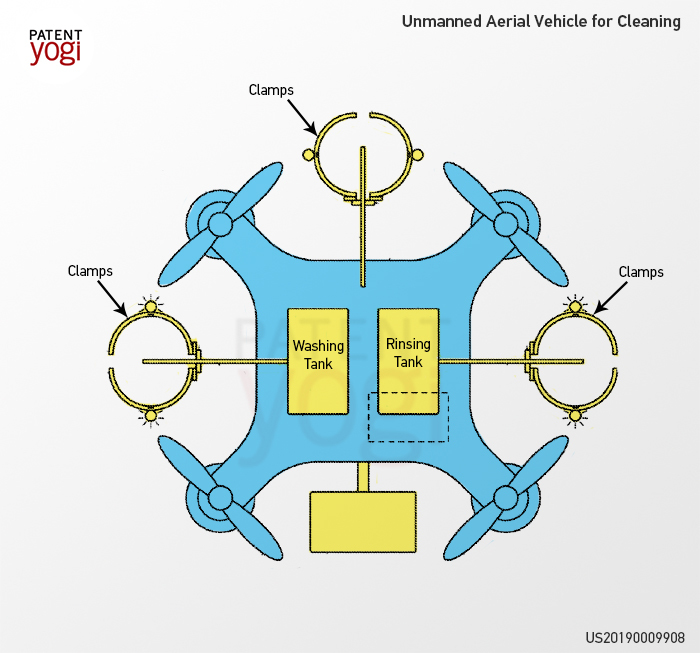 Although the patent mentions using the cleaning drone for cleaning sensors placed on cars, nothing is stopping Ford from increasing the capabilities of the cleaning drone to clean the entire vehicle. 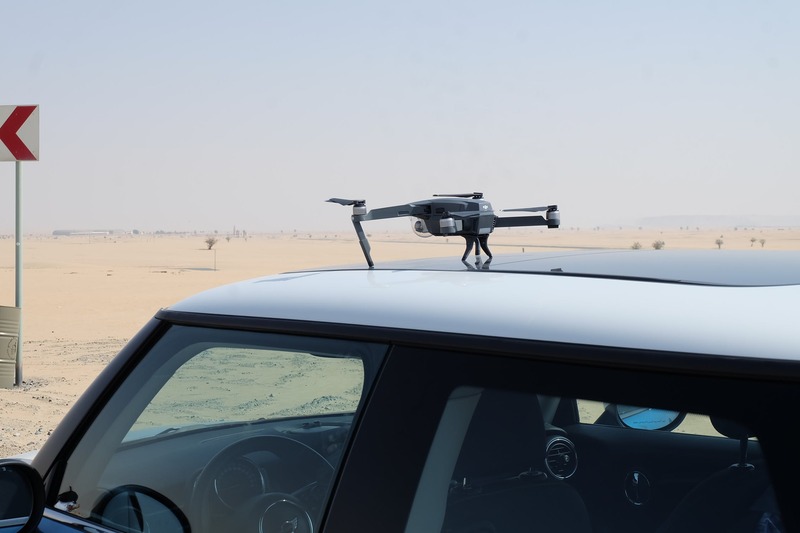 This nifty invention may soon be the norm for car manufacturers, with every manufacturer offering similar companion drones with vehicles. It looks it’s only a matter of time before drones have the capability of making automated repairs to our vehicles. The future avenues definitely look promising. Previous PostDid Apple just patent the Apple iRing?